Safilo is re-inventing conventional design methods through the investment of a Stratasys J750 3D printer for use during the iteration process in the production of fashion frames. As one of the worlds largest eyewear manufacturers, Safilo needed a faster way to respond to shifting market demand due to the ever-subjective nature of fashion. Through harnessing the use of rapid prototyping with 3D printing, the company is able to iterate their designs faster than ever before. Adopting the full-colour J750 3D printer has provided an efficient solution in the reduction of time to market, significantly decreasing the time required for the production of its frames on average by four-fifths. The J750 Polyjet 3D printing system allows for printing in over 360,000 colours with the ability to blend up to 6 different materials to support the use of translucent or block-colour models as well as adjust the flexibility or rigidity of iteration material properties. The J750 provides manufacturers and designers with unmatched product realism through the highest aesthetic performance available on the market including true, full-colour capability with texture mapping and colour gradients. With 3D printing, we can play with textures and transparency, as well as blending a wide gamut of colours to achieve an incredible result, quickly and cost-effectively, says Luca Bordin, 3D Modeling Specialist at Safilo. This ability to iterate often without incurring expensive costs allows us to perfect our design early in the design cycle. This arms us to not only dramatically reduce our turnaround time, but helps improve communication with the designers, enabling us to achieve the best product possible. Founded in 1878, Safilo found itself quickly rising to success, taking its place as the second-largest producer for eyewear across the planet. Safilo is especially renowned for its intricate craftsmanship in manufacturing sunglasses, sports eyewear and prescription frames for over 90,000 stores in 130 countries. Some of the 25 luxury brands it boasts are recognised worldwide as designer names such as Dior, Fendi, Jimmy Choo and Hugo Boss, alongside five of the companys own brands including Carrera, Polaroid and Safilo. In order to maintain the companys exacting standards for style, creativity, functionality and quality, Safilos design and iteration processes demand accurate, detailed and true-to-life prototypes. The prototyping process also demands fast and efficient throughput due to the large amount of frames produced by Safilo. The company previously produced its concept prototypes with CNC machining, using these concepts as a template to manually develop actual prototypes, resulting in lengthy lead times and inaccuracies, which could prove costly further down the production line if iterations were required. In order to overcome the bottlenecks often associated with conventional manufacturing methods, Safilo invested in the Stratasys J750 3D printer, which now enables a streamlined prototyping workflow, as well as the opportunity to achieve a much greater prototype realism than any conventional methods could offer. Utilising the J750s large build tray, Safilo is now able to produce a number of frame variations in one printing batch, increasing throughput and securing reduced developmental costs through the ability to produce full-colour prototypes with variations in texture and intricacy built directly into the plastic and in a fraction of the time previously spent in the iterative phase. 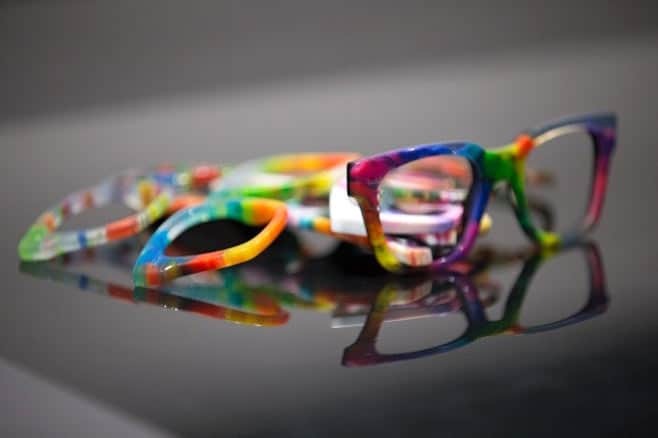 The ability to have our 3D printed concept prototypes mimic the exact same colour and texture as the finished product has significantly accelerated the development of new eyeglass frames, says Daniel Tomasin, Product Sample Coordinator at Safilo. In fact, with the removal of painting from the process, we can quickly respond to market trends and reduce our prototyping cycle from 15 hours to just three hours. This has slashed our developmental turnaround time by 60%, excluding post-processing, allowing us to accelerate our time-to-market and maintain our competitive edge with the launch of the latest fashion eyewear. This is the start of a new age for designers. Thanks to the ability of Stratasys full colour, multi-material J750 to combine an endless gamut of striking colours with varying levels of transparency, we can produce a number of completely different frames and secure levels of product personalisation that were previously unattainable, says David Iarossi, Safilo Creative Designer and Associate Director for Carrera, Givenchy and Havanianas. As you can imagine, in the eyewear industry, personalisation is key. â€œStratasys 3D printing is fantastic. The frames surpass those produced manually, particularly as we no longer need to worry about the paint fading since the colour is integrated into the 3D printed frame. Stratasys full colour, multi-material 3D printing has unleashed a fresh dimension of creativity and faster route-to-market than our previous methods allowed, he concludes.